I want to thank those of you who left comments on Monday's post - it's so interesting for me to see how differently, and yet, really, how similar we all are when it comes to the way we look at food. I know I will be going back to read these again and again for reassurance. If you haven't had a chance to read the comments, please do - a treasure trove of great thoughts awaits! C'mon, dad...cut me a piece! Waiting patiently...although you should see Paco when the watermelon is sitting, uncut, on the counter - he keeps standing up and sniffing it, and then tries to herd us into the kitchen to give him his share! 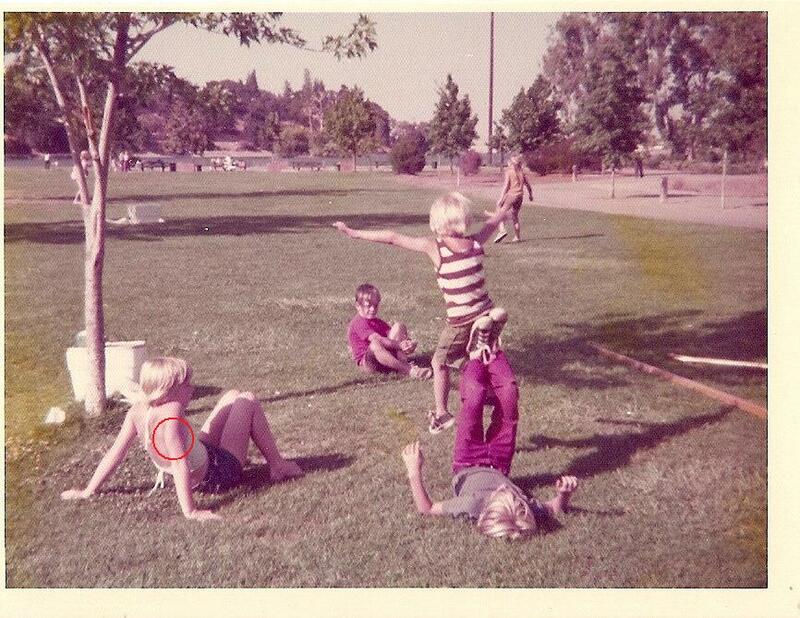 I was looking at some old pictures the other day and noticed something in this one - you may have to click on it to really see, but look at the area on my arm where the red circle it...do you see it??? A tricep muscle! 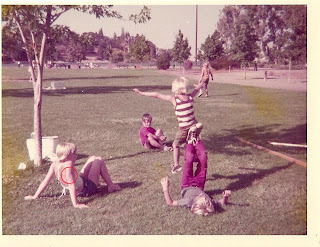 Dang - I had muscles way back when! And it only took me 35 years to get them back, lol! Me, my brother (facing camera) and two boys whose names I can't remember. Judging by the fact that I am hanging out with my little brother and his friends, and the mast and other boat parts are still on the grass, we had probably just arrived at Vasona and obviously Matt's family hadn't gotten there yet. You know I would have ditched the little kids as soon as my sailing club buddy arrived! Now for a new, sometimes-recurring feature on the Friday Mishmash - I give you Things That Are Just Wrong. First up: Dogs with human teeth. No. I can barely stand to look at this picture. And yet I can't not look. Next up: baby corn. Not only is it wrong, it just ain't right. Creeps me out, big time! This week's Fashion Friday begins with what I wore last Friday to work - it had been an incredibly hot week, and the A/C in our building wasn't freezing me out like it normally does. Hence the easy, breezy dress. As soon as I realized that my toes matched the dress, I went with that and did a tri-color extravaganza of blue, white and silver (some days I entertain myself waaay too much in choosing what I wear!). My bargain $6 dress from Kohls was paired with a white cami, last year's bargain $7 white and silver sandals from Steinmart, and for jewelry, an old beaded necklace that belonged to my Grandmother - I just twisted it and doubled it up for a shorter length. Earrings were a cute pair of silver and blue dangles that I got years ago at Avenue for $2 - proving that you don't have to spend a lot to look decent. I *do* loves me a good bargain! Close up of necklace, earrings and long hair (ooh, foreshadowing!). Next we have one of my standard outfits - Bermuda shorts and patterned t-shirt (better to hide the belly with, m'dear!). I'm including this one for comparison...I think there is a big difference in how my legs look with this length of shorts vs. the capris I wore in the next set of pictures. Note my matchy-matchy silver sandals that go with the silver foiling on the shirt, and of course the silver jewelry! What IS cool about this outfit is that I can easily button the jacket - I bought it last year and while it fit I got it on, it fits much better now. Paired with black capris and my cute pink ruffled tank from Loft. Jacket open, which is how I really wore it. But it was fun to button it for the picture! Didja notice I got a hair cut? Half an inch was taken off. LOL. I love my hairdresser, but this was way more than half an inch. She doesn't like my hair being longer than my face now that that it's "so thin" (her words) so she tends cut it shorter to balance everything out. Makes it hard to put in a pony tail for running, but oh well, it grows fast. you lost me with the HAIR. I am thisclose to being ready for a big cut (meh actually I am totally ready :) the husband adores my hair so for him for now Im leaving it alone :)). how long does it take for you to get it to look as it does? or is it natural body? Love love Friday's outfit. The bermuda looks slimmer on you than the capri's. Maybe mix Friday's top with the shorts, I think you look smashing then. Love to see Paco begging for his watermelon :lol: Bella loves all kinds of fruit so I recognize this. Ahhhh, I love summer dresses. Just wore one to the office yesterday and felt so, well, perky and "flouncey". And you definitely look like the summer dress is your second skin. I've noticed the leg phenomena too Shelley. It's all about where the shorts/capris/skirt/dresses fall. I have calves that are as big as a linebackers (Mr. Helen's description but he's just jealous because he has the calves of a running back!). The thing is lots of times I don't notice it until I get to work because there's one wall of mirrors in my office so I get a real good look. Maybe I should start taking pictures. I had no idea that a dog would eat fruit. For some reason that's tickling my fancy! Your hairdresser is right about your hair. It looks great! It makes your face look younger. Keep it that length. I know it's a bit of a pain for running, but put on a ball cap. lol! You're looking good girl! you look beautiful and scream confidence - way to go Shelley! That dog with the teeth is hilarious! Our dog Ed loves watermelon too - but he eats the rind too - as soon he hears the knife chopping the watermelon he is at my feet! Wow you look amazing...so great to see your transformation from "then" to "now"! I love your hair...who would have thought it would make such a difference...but I think that you are definitely stylin' with your new 'do. I *lurve* that blue dress! And the fact that it was a bargain is a triple score!! The baby corn and the teeth look GMO. Avoid at all cost. I hate when a hair stylist thinks they know better when NOT ASKED. I have very long hair, and once visited a new stylist for just a trim ... 1 inch. She hacked off a good 5 inches before I could stop her. I had to pay but did NOT tip and made sure she knew I'd never frequent that place again (talked with the manager). I digressed. Your hair looks cute, tho. Love the pink top. I agree about the capris...most women really don't look good in them! Maybe if they took a pic in a mirror??? Yes, I agree about the dog with teeth and about the fetus corn--they always creeped me out when I was a kid. And I laughed about the same scene in the movie Big as Lynn mentioned. But your hair does look fantastic. You are such a fashionista! I get up and think, hmm, I think I'll wear this scrub top today. Cute outfits and you look super cute in those shorts with matching sandals and accessories. I need to buy more accessories. 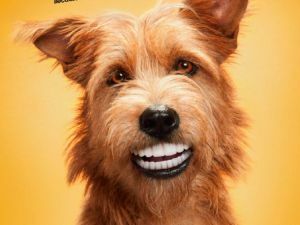 Yup...the dog with the human teeth thing freaks me out too...yet, I must look...haha. 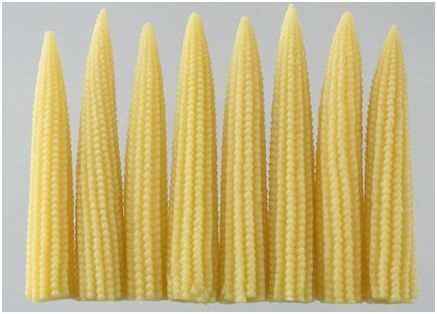 The baby corn thing cracked me up! Your hair looks great and so does the rest of you!! 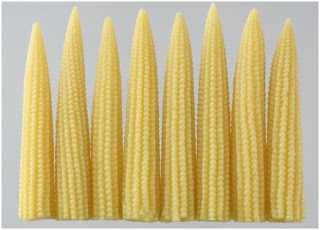 I HATE baby corn. Pretty much all Chinese veggies (baby corn, water chestnuts, mushrooms) are the only ones I hate. I LOVE that jacket you're rocking - SO cute! Paco and Fashion Friday, what fun! That blue dress is my favorite, and it looks great on you!! Have a good weekend! I do loves that Paco. I have a girl crush on you. I LOVE LOVE LOVE the pink top and the hair! You are stunning. Your dog is too cute. I've been freezing watermelon and then putting it in the food processor and it makes an icy: YUM! I just LOL-ed when I read "Vasona". Haha. Spent many days there, and so many family picnics. Following your blog is like keeping up with an old family friend. Too funny! ps, I really liked the pic of you as a kid. I recently was going through pics when I was a kid and posted a couple to my blog because in one I was scarfing down spaghetti and had it all over my face and the other I was sitting on my dad's weight bench (I used to work out with him when I was little)>....both were foreshadowing of things to come in my life! I was looking at the picture of you that was just your face in this series and my mind wandered a little bit because my son has started a war (a la MWII) in the livingroom and when I glanced back at your face, I thought I was looking at you from years ago - I think it reminded me of the summer I lived with your family, which was the same stummer I stole the candy off of your gingerbread house (I'm sorry, still). Anyhow - you now look like a teenager. Do you still get carded?